210 Ticks in 5 Minutes: Could You Have Caught This Move? 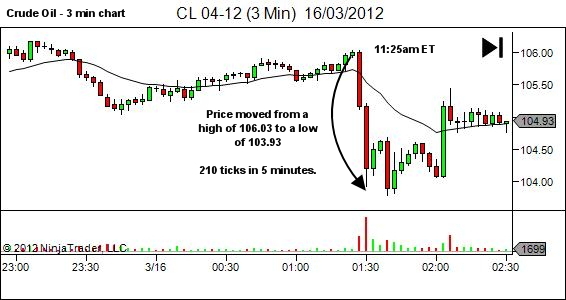 A YTC reader Ryan asked if I could discuss a 210 tick move in Crude Oil that occurred at 11:25am ET on Thursday, March 15th 2012. Would you mind detailing the entry opportunity on that 11:25am short provided there was an opportunity? Thanks! First let me address a couple of important points. I didn't trade this move. In fact I wasn't even trading at the time, having finished my session maybe 45 minutes earlier to write up that night's blog post. I'm currently trading YTC Scalper timeframes (1-min & below) in a session that rarely if ever goes beyond 11:00am ET. And most importantly, please treat all hindsight analysis as suspect. In the following paragraphs we'll be examining the charts to see how we could have entered short prior to this move. But we're doing this with the benefit of hindsight. There is a tendency called hindsight bias in which the human mind views past occurrences as having been more predictable at the time than they actually were. You may have experienced this when reviewing any historical chart and noting the many setup and trade opportunities. Somehow they all look easy. And there is a confident belief in the fact that you would have entered at the right time, and quite likely would have targeted just the right area for maximum profits. The reality is far different. Uncertainty prevails at the hard right edge of our screen and there is actually no way we can know how we would have felt, decided or acted, were we actually trading this live. So… while this setup actually will apppear quite simple, it may not have been so obvious at the time. You may well have had a bullish bias leading to you passing on the entry short and sitting on the sidelines watching in disbelief! Our analysis will be based upon a 30-minute chart for S/R structure, a 3-minute chart for trend and setup and a 1-minute chart for fine-tuning, as is standard for readers of theYTC Price Action Trader. 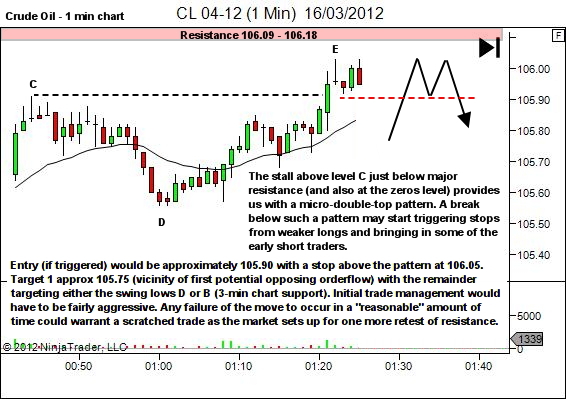 Of course, the concepts discussed can be applied on any other timeframe combination. 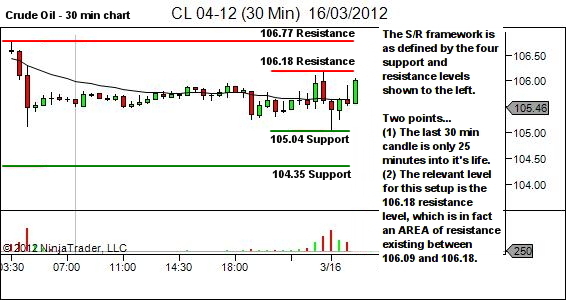 The following 30-minute chart shows the S/R structure leading up to the market fall. 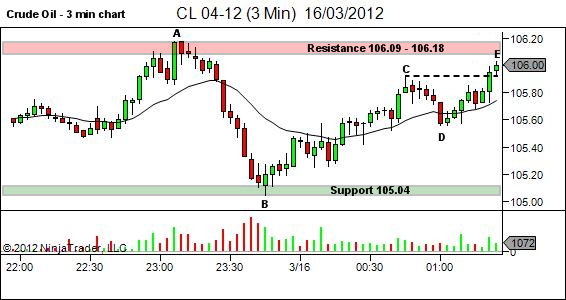 Of note is the fact that the resistance level relevant to this setup is the 106.18 level. S/R however are not really single price points; but rather they should be considered areas. Based on the 3-min trading timeframe chart which allows us more detail, this level is defined as actually being between 106.09 and 106.18. Let's now review the 3-minute chart to see what the price is doing leading up to the setup (01:25 chart time). This is actually a really nice short setup. Price swing CD actually showed the first sign of some bearish strength (actually probably more of a surge short as some of the weak longs were stopped out). And this was followed by another weak continuation DE. The second last bar appears quite bullish, but price then stalls on bar E, right at the zeros level and just below resistance. Weak bulls will again be nervous. Looking at the lower timeframe 1-minute chart we see a really nice stall pattern, offering a double top trigger entry short. So to answer your question Ryan, yes, there is every possibility that a trader could have "accidentally" caught this move. I say accidentally because the outcome would not be a result of any skill or superior knowledge. More just luck. But then a big part of luck is just being in the right place at the right time and willing to take on some risk. Assuming our bias was short and we did place orders, the only remaining question would be the order type. Personally I'd most likely have a stop limit order rather than a stop market order. Depending on the way price moved it could well have jumped straight over my order without filling. Market replay did fill the order though. 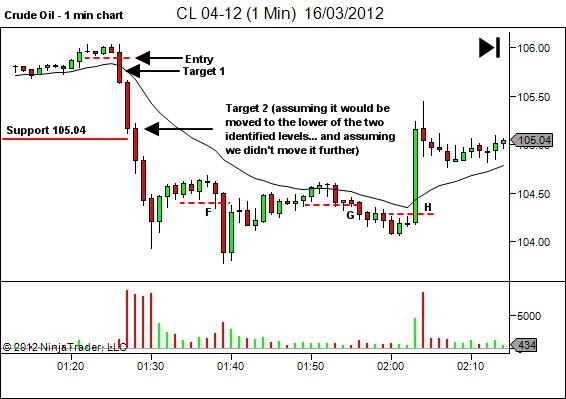 It also shows about a 40 second stall just above target 2, prior to continuing through the order and then lower. Given this stall it's unlikely I'd have moved the target order lower. In fact, I may have taken the profits 5-10 ticks higher (it's so close why risk losing the open profits).